My friend Danielle acted as a Committee Co-Chair and did an incredible job organizing Top Nosh and its food, drinks, silent auction, and venue. 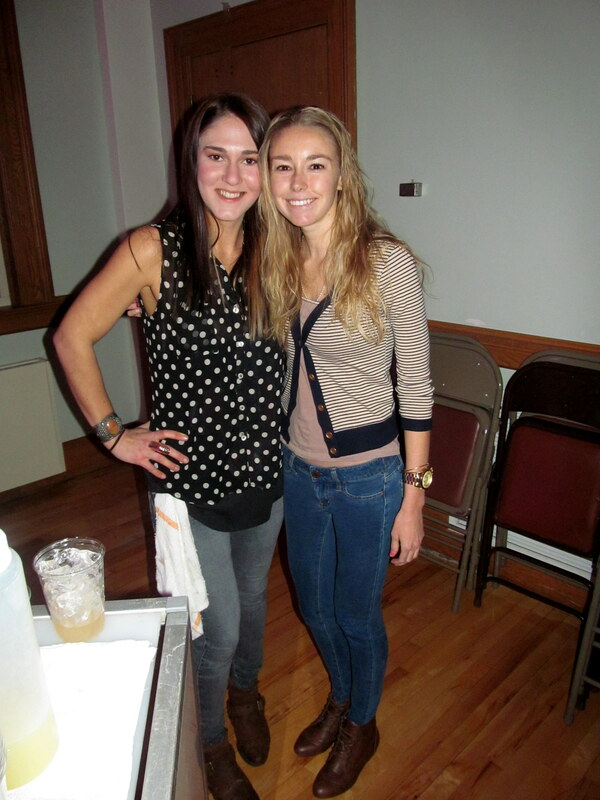 I felt a bit under-dressed in my American Eagle jeggings and ideeli boots after Danielle greeted me in a fabulous bandage dress and heels, but my friend Alexis joined me looking casual as well and the crowd was large enough that I didn’t feel like I stood out too much. Me and Alexis rockin’ jeans, boots, and long-strap purses! 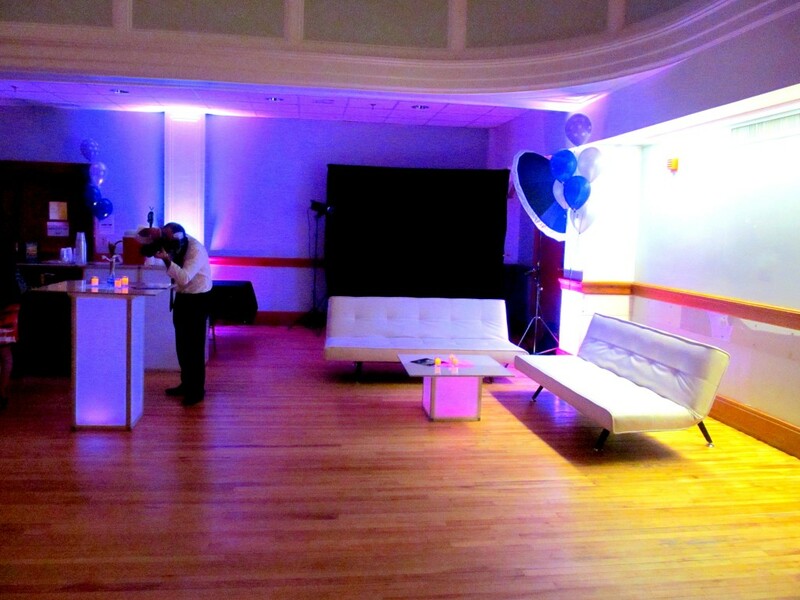 Top Nosh may have been held in a Town Hall Auditorium, but the committee did a great job classing it up with savvy music (imagine instrumental tunes out of a gala scene in Revenge), glowing candlelit tabletops, and simple white leather couches. I didn’t bid on any silent auction items, but my friend Jill won a trip to Villa del Palmar in Cabo! If I went into all the items up for bid this post would be even wordier than my recap posts usually are (no, seriously) but examples include a private wine-tasting party for 20 guests at Super Cellar Wine Loft, a boat ride to Watch Hill, lots of jewelry, and plenty of beauty treatments! 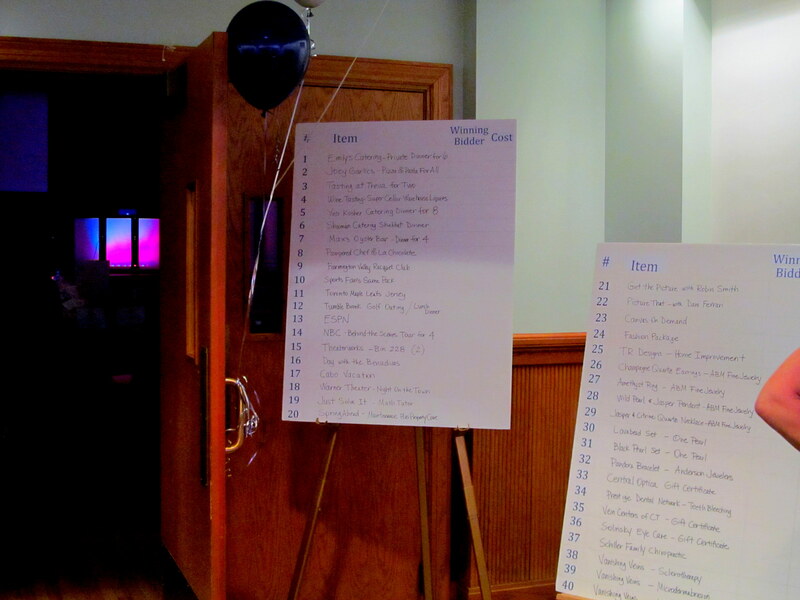 List of auction items at the event entrance. Bids on bids on bids. I didn’t bid on anything because I was too busy taking camera and Instagram photos of the food and drinks! Before Alexis arrived I “made a lap” to formulate a “plan of attack” for us, and we started our rounds at Treva‘s cocktail table. I really need to get over there (in West Hartford Center) to try their drinks, which have always sounded fabulous to me. 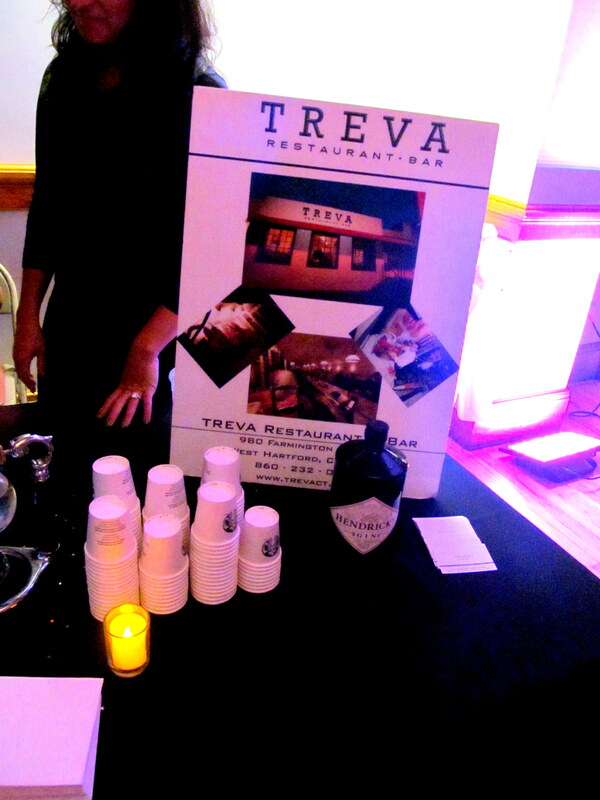 Treva met my expectations with a gin and vodka rooibos tea cocktail! It not only tasted wonderful, but it looked damn pretty as it was brewing too. 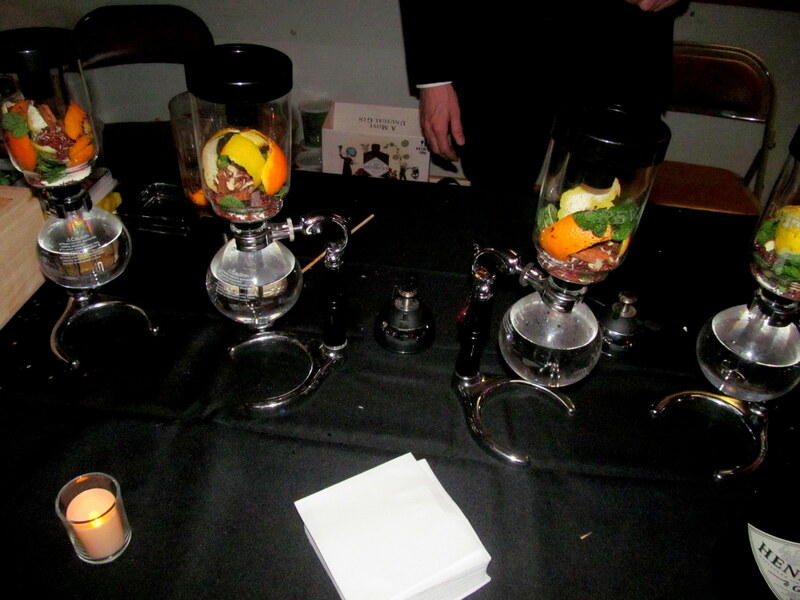 Now that’s what I call mixology. We skipped the cocktails at the JT Connect station because they didn’t look particularly interesting to me, or matching to my tastes. 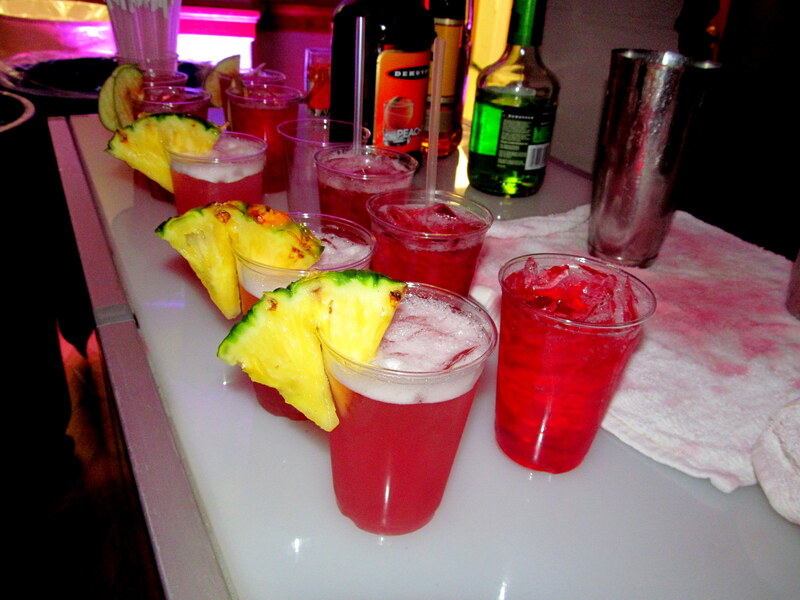 Too much fruity juice being poured! They sure looked fun though. Whoever she is, I want her dress. Unsurprisingly, my bartender friend Anna was mixing up my favorite drink of the evening at the West Hartford Barcelona Wine Bar table! I’d just blogged that afternoon about their Love & Bitters Cocktail Class, so my palate was craving a Barcelona beverage! Anna showin’ off the goods (and I’m not just talking about her amazing arms). 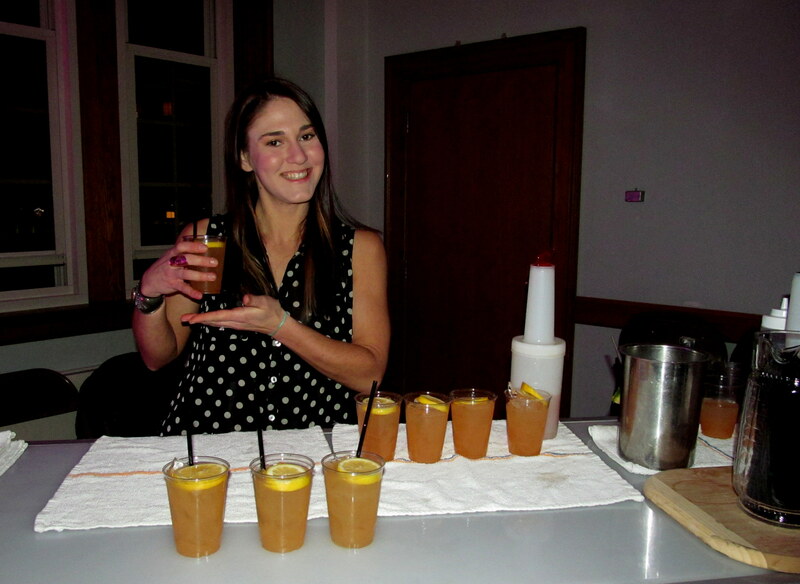 The tea cocktail theme was kept goin’ strong (and the drink was strong too) by the Summer St. Sling: chamomile-infused Tito’s Vodka, fresh pink grapefruit/lemon juices, and grapefruit bitters. If it wasn’t a weeknight, I’d have had a second cup! 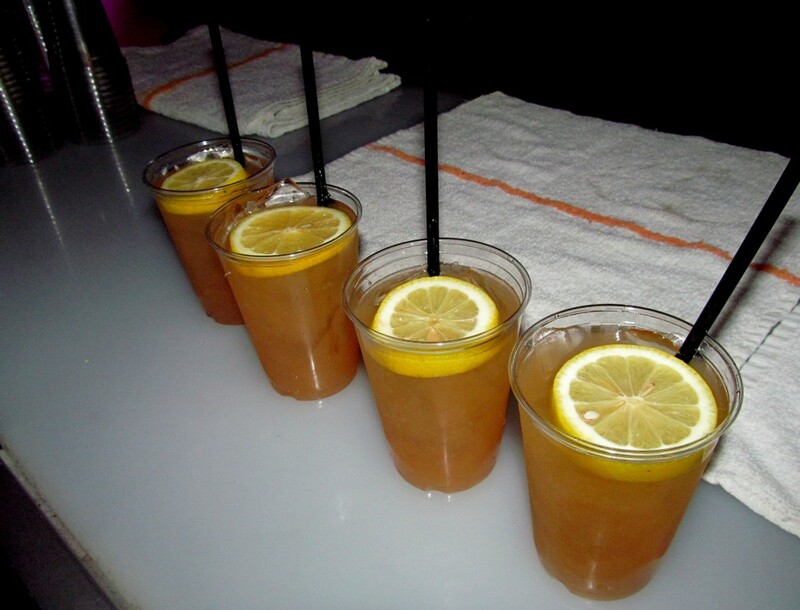 I’ll take one of these on the beach, please and thank you. Ahh, as I type and relive this cocktail (too bad my tastebuds aren’t) I’m getting so excited for my next tasting this Wednesday 3/6 at Bartaco in West Hartford. Bartaco is in the Barcelona restaurant family and the class’s title is Tequila 101. 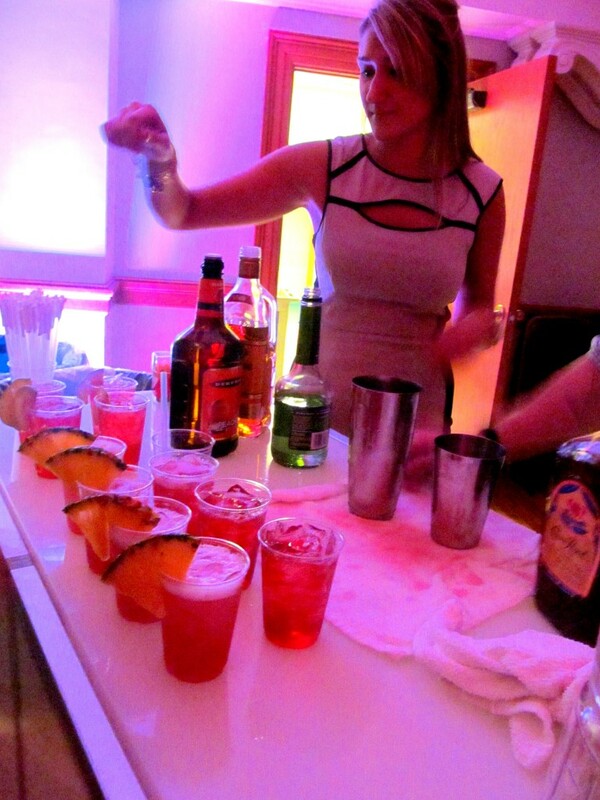 Yup, despite a terrible night my senior year of college, I do enjoy a good tequila lesson. A photo from that tragic evening…okay, tangent over. 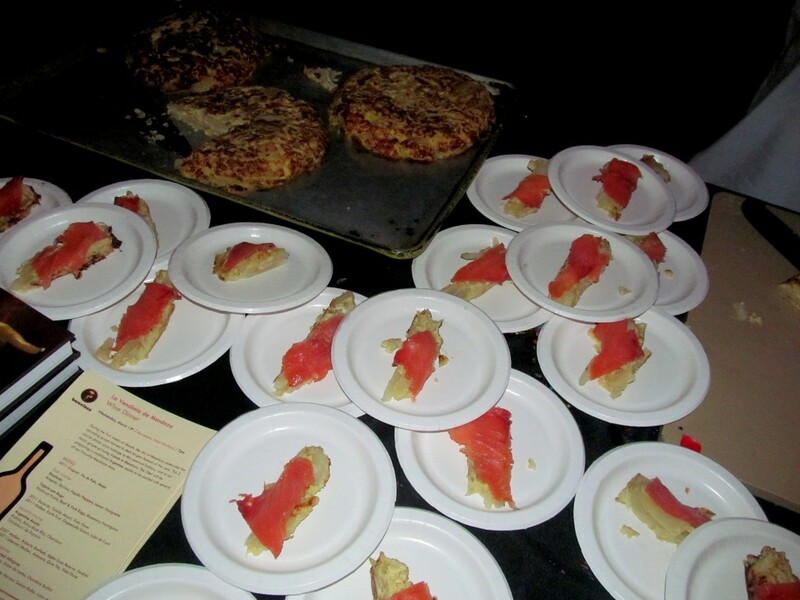 Barcelona’s newest chef, Alex Feldman, was working the restaurant’s food and putting together small plates of smoked salmon atop potato onion pancakes. Smoked salmon? Potato ANYTHING? Alexis and I were in heaven. We had to have seconds! I met Alex at the Love & Bitters event, and he is so down to earth for such a talented guy! He has promised me a cheese making lesson and I can’t wait to take him up on it. I’m also trying to get him on the blog to do a guest post…stay tuned! Either I make him look really tall or he makes me look really short. 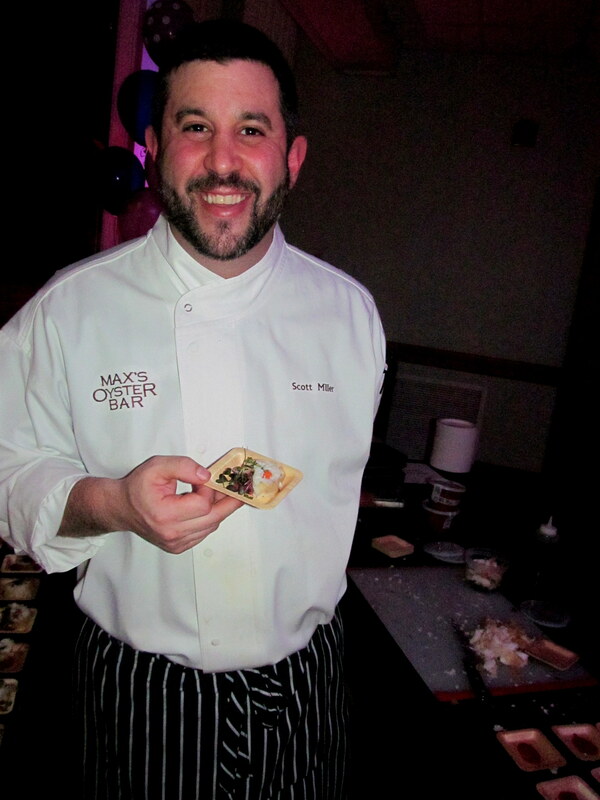 I also visited another talented chef I’ve met before, Chef Scott Miller of Max’s Oyster Bar. 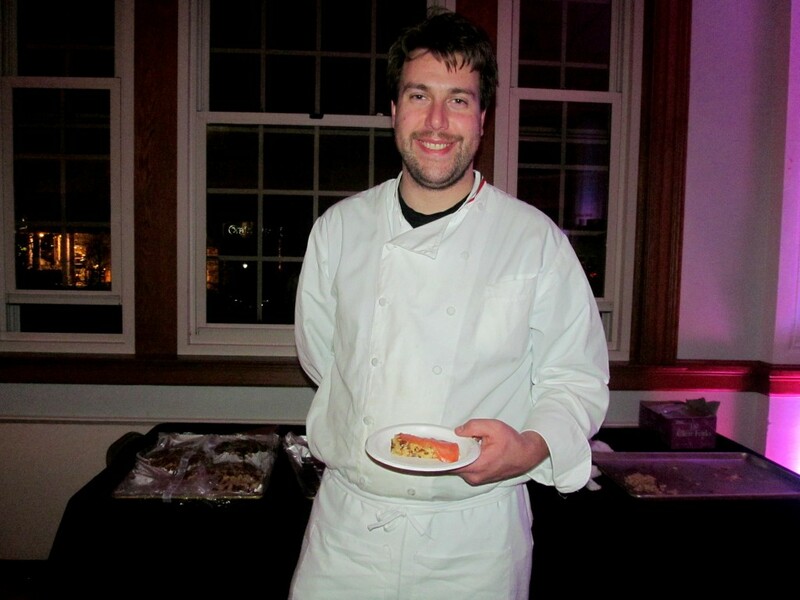 I was psyched when I first heard a Max Restaurant would be at Top Nosh and even more psyched when I noticed Scott manning the table, because I knew he’d have some great seafood for Alexis and me. That little dish was fabulous and Alexis and I were sure to take two. Good thing – we got to the table just as the last of the pastry-wrapped white fish was disappearing. Scott’s small plate reminded me of sushi wrapped in a pastry instead of rice…and cooked, not raw…okay maybe the sushi comparison was a bad one. 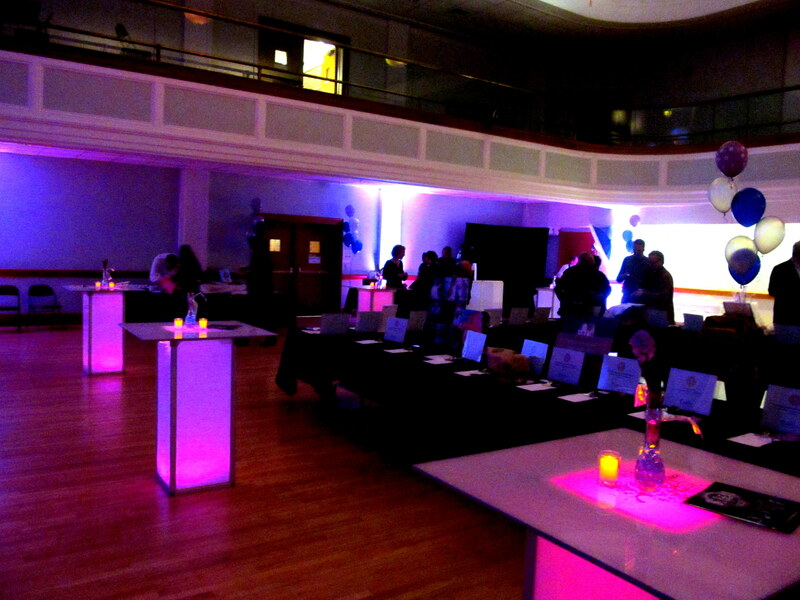 A shot of the table before the “cannibals” attacked! 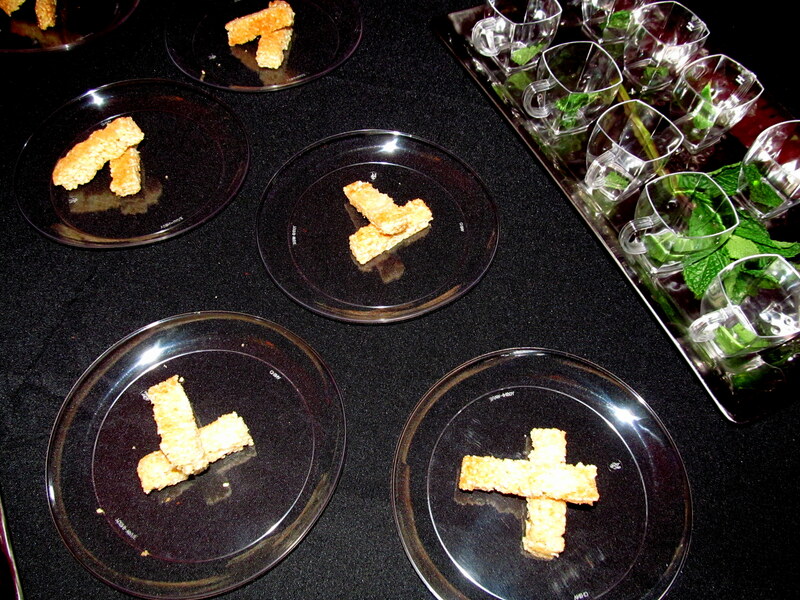 Only after I spoke with Scott did I realize all food and drinks served at Top Nosh were kosher. In fact, all the ingredients coming in were checked by a rabbi to be sure they complied with kosher rules, and some of Scott’s were not allowed in! Of course he accepted that as a challenge. and still made a tasty contribution to Top Nosh. 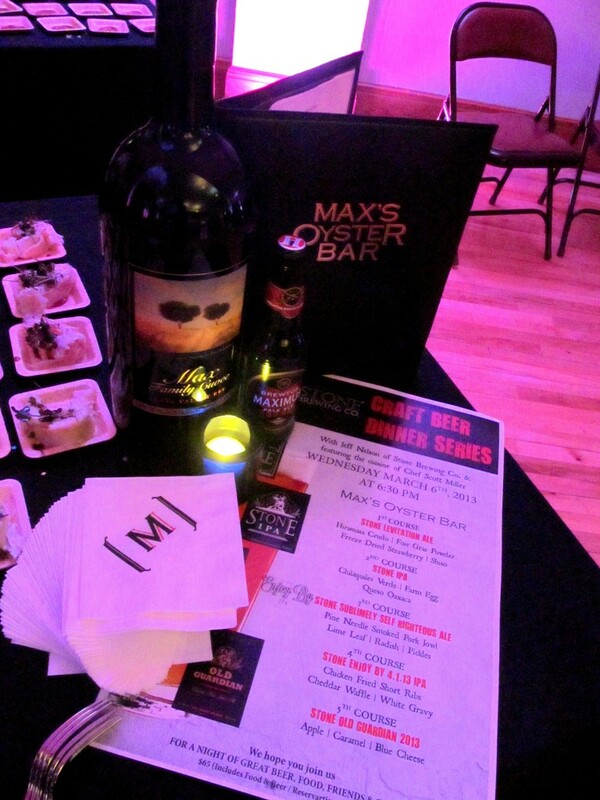 A display promoting an upcoming Max’s Oyster Bar beer dinner…which, alas, is the same night as the Bartaco event this week! 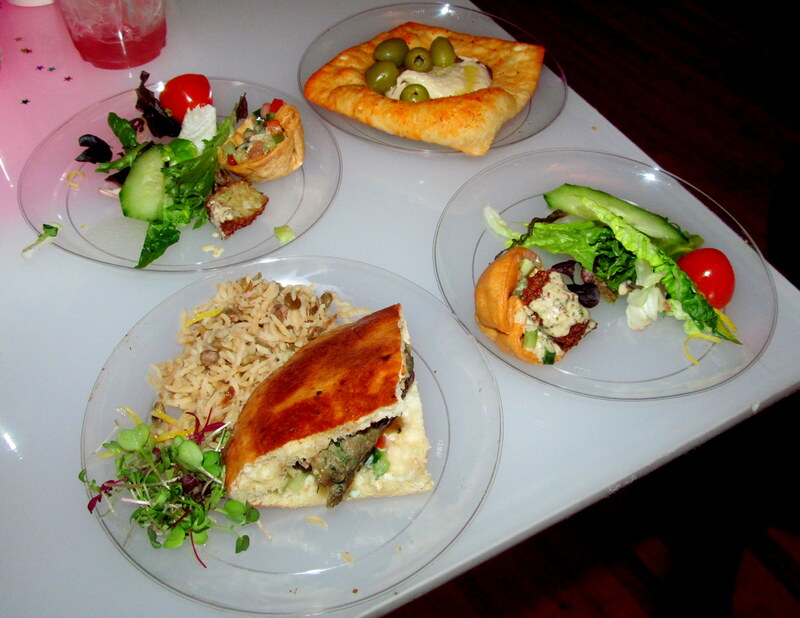 Yosi Kosher Catering‘s gorgeous table display consisted of plenty of Mediterranean-style goodies. Alexis and I were in absolute heaven and grabbed a little bit of everything. Greek salad, crispy flatbread, olives, hummus, lamb, falafel, and rice! 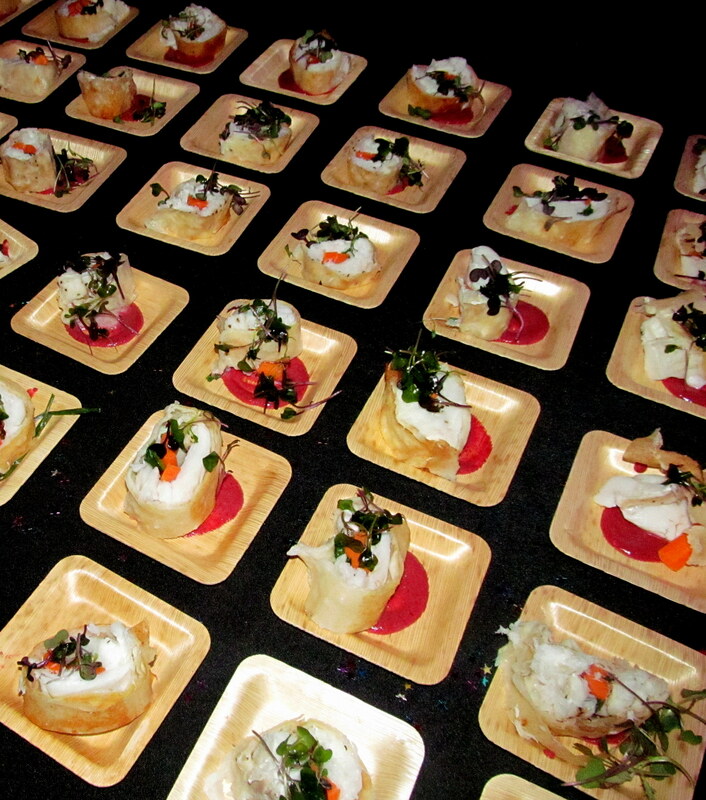 Yosi specializes in ALL things kosher…even sushi! Hot tea and sesame sticks. 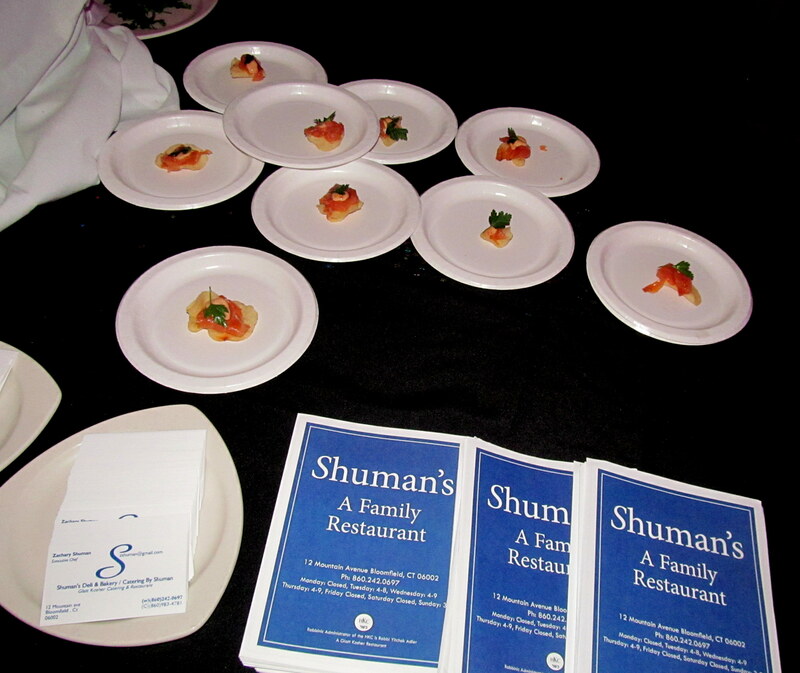 Shuman’s Family Restaurant & Catering of Bloomfield also served a kosher smoked salmon dish…that I sadly did not get to try! I should have swiped a plate when I took the below photo, but I was waiting for Alexis and by the time she and I visited the table again the savory food was gone! Okay Shuman, we’ll forgive you, because you make a MEAN dessert. 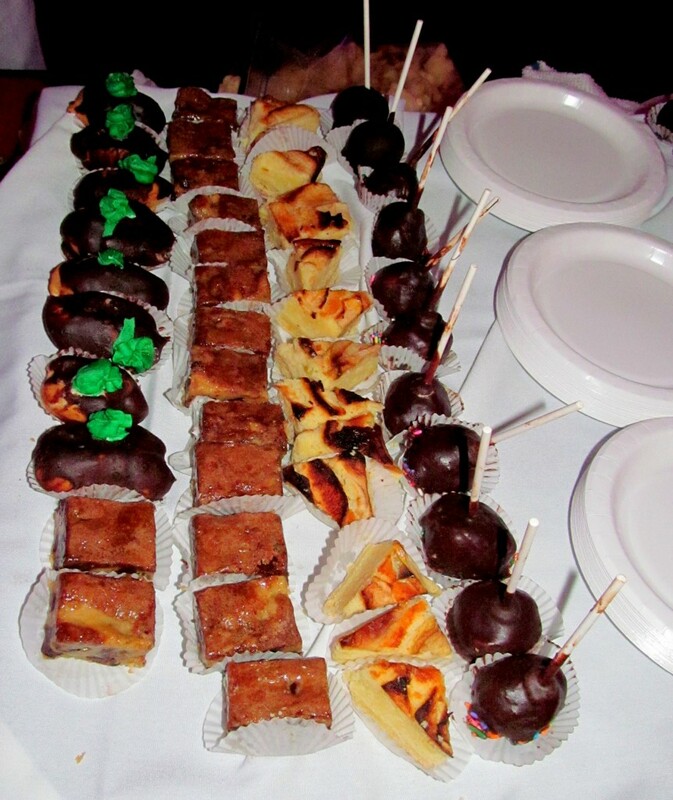 Mini desserts are my fave….I can try them all! And that’s exactly what I did. The mini eclairs (above, upper left) were perfect and I’m not sure what the pastries in the middle two rows were but one reminded me of baklava. 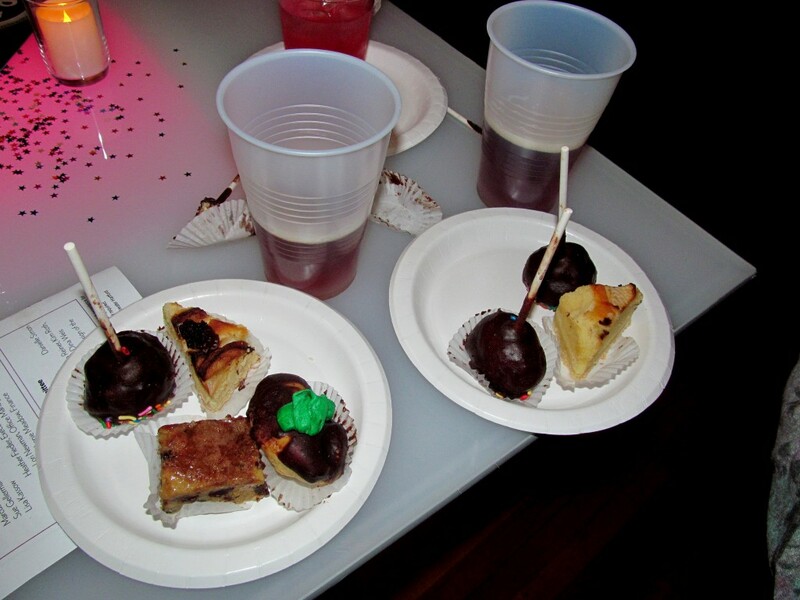 And oh man…the cakepops. CHEESECAKE cakepops. Cheesecake cakepops made with TOFU. YES!!!! Yes, that’s beer with our dessert! 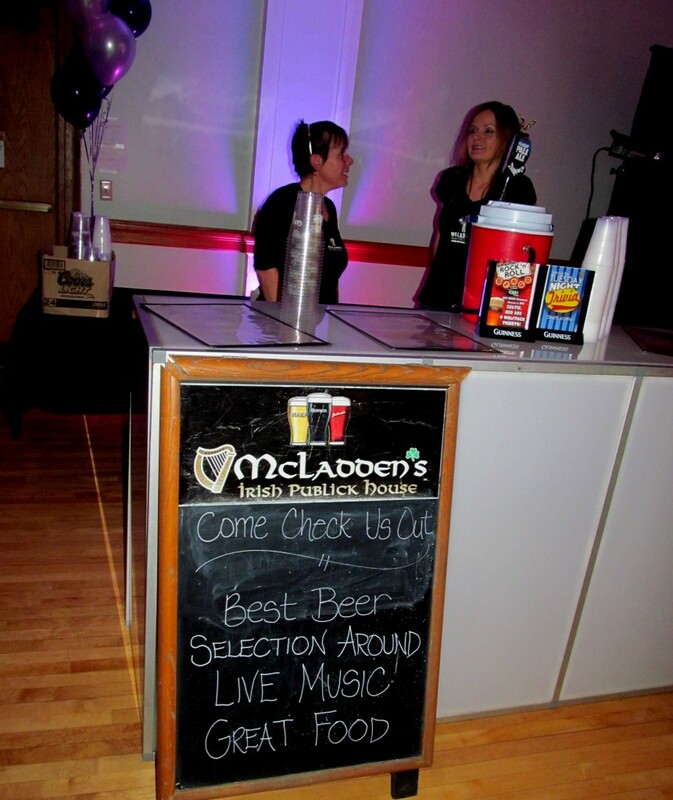 The only beverage we hadn’t sampled yet was McLadden’s beer. True to form, I took a few sips and abandoned the rest of my cup. At least I tried. 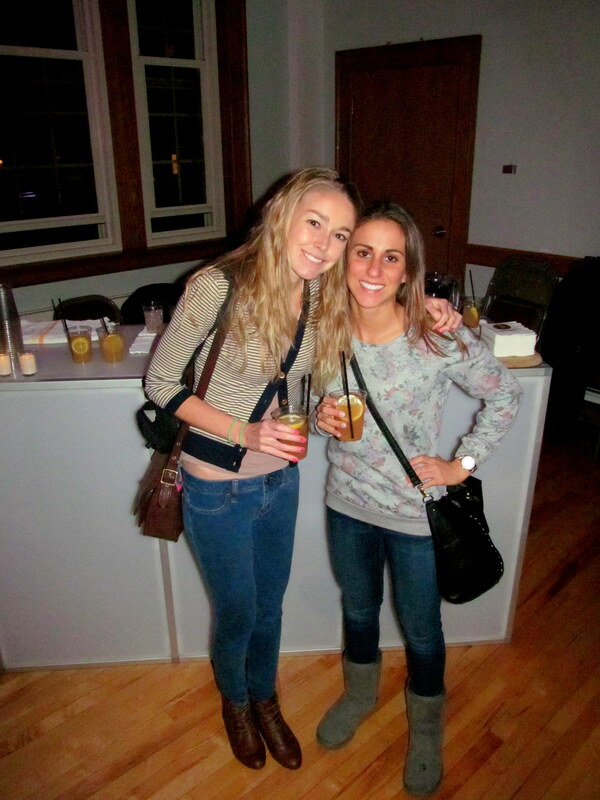 Alexis is a great friend to attend a weeknight (or any) event with, because she understands my bedtime…she has one too! So we departed before 9PM, but not before I got a picture with my girl Anna. Every time I see her it’s such a treat! She’s the definition of FAB. 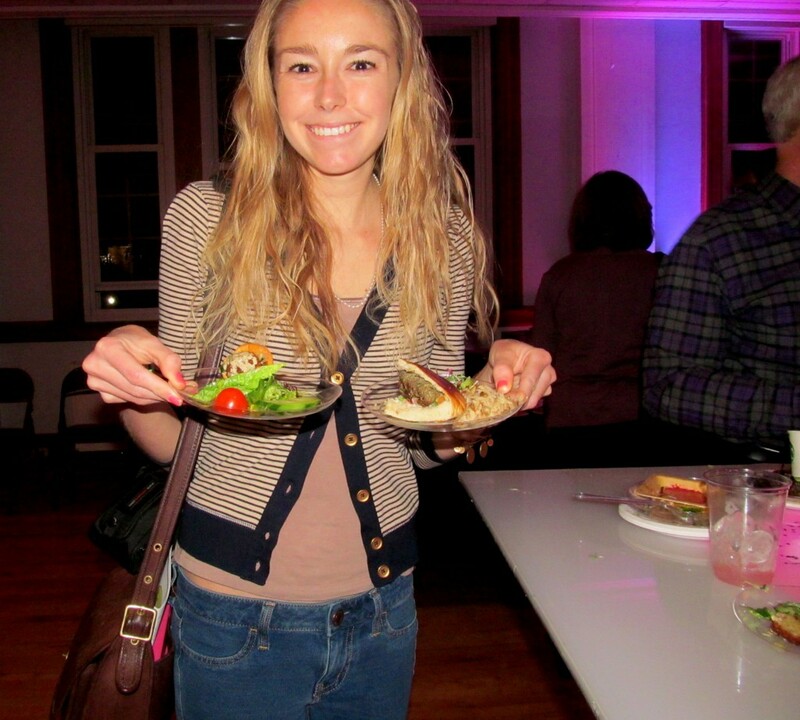 Small plates…great tastes…all smiles. 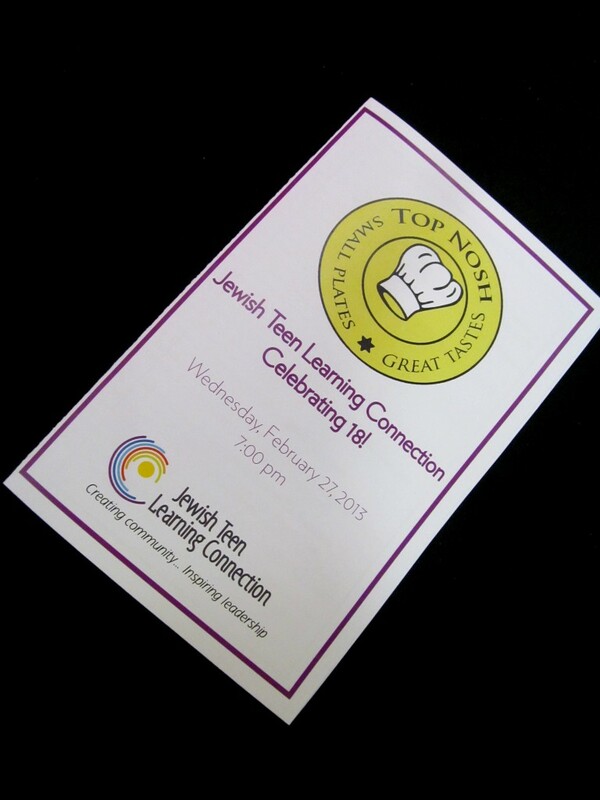 Thank you Danielle and the rest of the Jewish Teen Learning Connection for inviting me to experience Top Nosh! 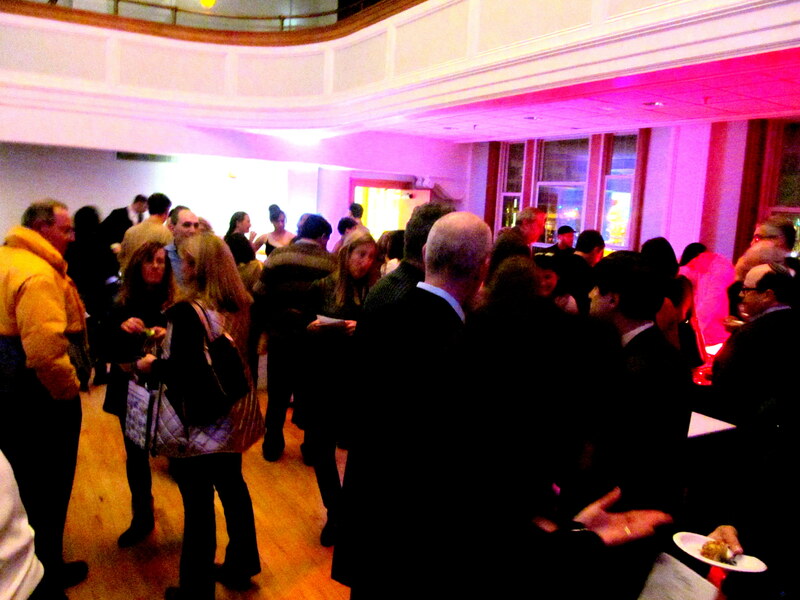 Have you ever been to a charity fundraiser? Which small plate and/or beverage looks most up your alley? 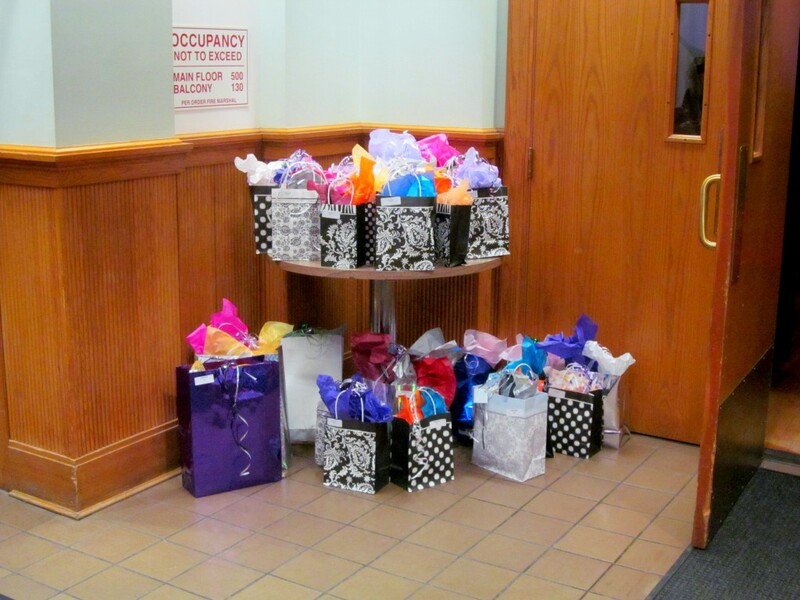 Have you ever bid in (and won?!) 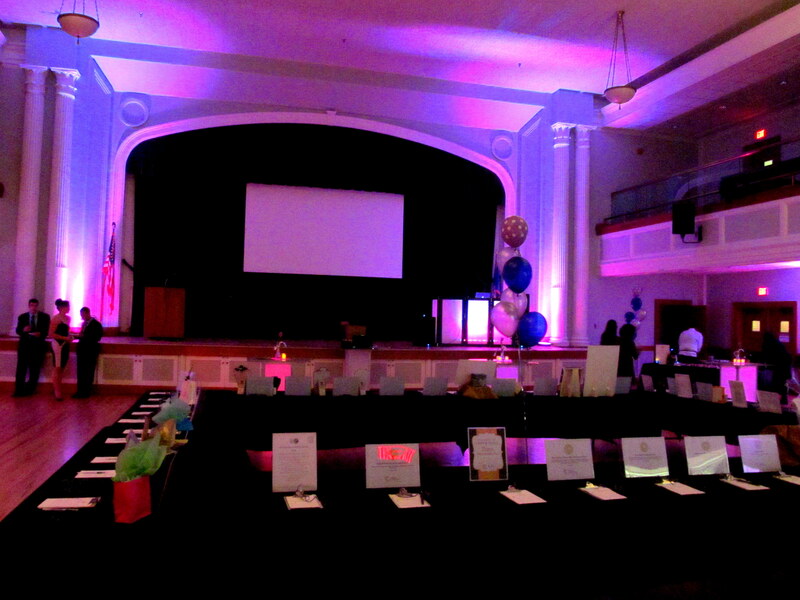 a silent auction?